New Zealand captain Daniel Vettori got just what he wanted on Sunday -- a perfect winning start to the World Cup -- and owes it to an unheralded pace bowling trio. Tim Southee (3-13), Jacob Oram (3-2) and Hamish Bennett (4-16) shared 10 Kenyan wickets among themselves to set up the team's ridiculously easy 10-wicket victory, a timely boost for the five-time World Cup semi-finalists struggling to put a wretched build-up behind them. As all captains would vouch, winning the first match of any tournament can do wonders for a side under pressure and with whitewashes by Bangladesh and India fresh in the memory, hardly any other team needed it as badly as New Zealand. So keen was Vettori for a positive start that he had no qualms in calling it a "must-win" match and his pacers did not let him down. Southee earned the breakthrough and then returned to mow down the Kenyan lower order while Bennett and Oram ran through the top and middle order in what looked like a perfect distribution of labour. It was hardly surprising that Vettori would profusely praise his bowlers even though their success came against arguably the weakest team of the tournament. "It's a great performance by the bowlers ... can't really ask for more from the start of a tournament," Vettori told reporters. He did not accept that it was more a case of poor batting by a vulnerable Kenyan side than a sensational effort by his bowlers. "I think we bowled well. 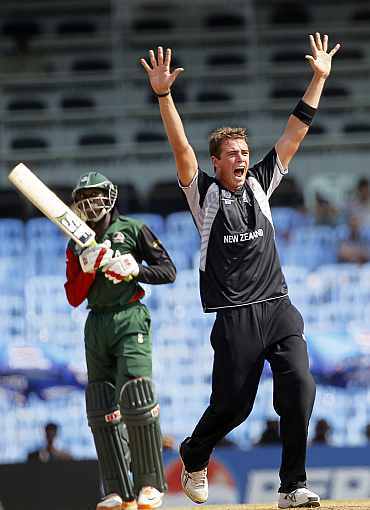 The bowlers got actually what I asked for and were consistent ... they were fantastic," Vettori said. It was quite a team effort by the pacers with Southee maintaining a tight length, Oram extracting extra bounce and Bennett bowling consistently full and straight which was too much for the Kenyans. The camaraderie was there for all to see too when Oram waved apologetically to Southee after claiming the last Kenyan wicket to deny his pace colleague a hat-trick chance. 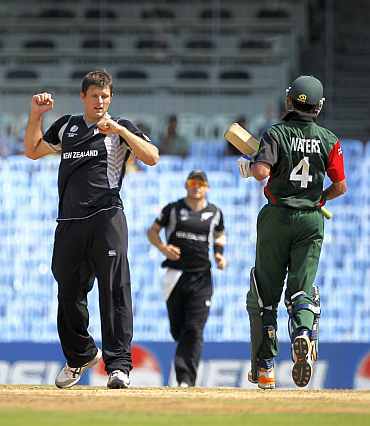 A spinner himself, Vettori did not underestimate the potential of spin either in Sunday's match. He paired off-spinner Nathan McCullum with Southee to open the attack, reviving memories of the 1992 World Cup when former New Zealand captain Martin Crowe had opened the bowling with Dipak Patel.